Sotheby’s and eBay will create a web platform to allow viewers to bid on and buy art. According to Sotheby’s chief operating officer Bruno Vinciguerra, the international art auction house hoped to reach “the broadest possible audience around the world” with the move. 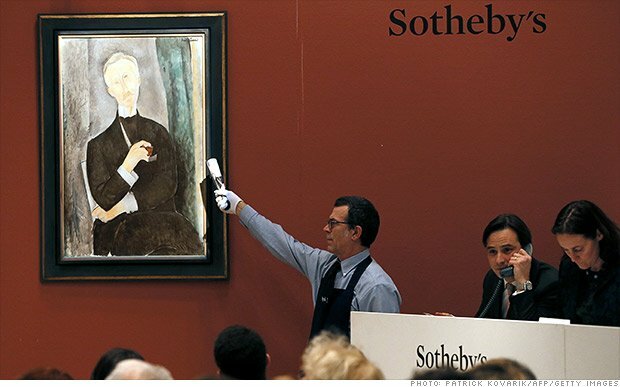 Sotheby’s said the number of lots purchased online increased 36% in 2013. Online art sales are expected to reach $13 billion by 2020. In April, John James Audubon’s elephant-folio The Birds of America sold for $3.5 million online via a live auction at Sotheby’s – a record for the company. The venture will start with live auctions streamed from Sotheby’s New York headquarters, which will allow “real-time bidding from anywhere around the world”. Sotheby’s will offer 18 categories to start, focusing jewelry, watches, prints, wine, photographs and 20th century design – categories the company says have been particularly appealing to online buyers. The move comes just ahead of eBay’s earnings, which are set to be released on Wednesday, and as more and more start-ups, such as Artsy, Artspace and Paddle8 allow consumers to buy art on the web. In 2013, Amazon announced it would sell works by artists such as Salvador Dali and Andy Warhol on its website. Sotheby’s and eBay declined to give a firm start date for the service.